Decorating for Fall is so much fun! I love switching out all of my summer stuff in favor of leaves and pumpkins to get in the spirit for the season ahead. Probably the most important place to update decorations, though, is actually on your porch. It’s the first thing your guests will see when they come to visit, and everyone who passes by can see it. But creating a visually appealing, autumn-themed front porch can be somewhat overwhelming. 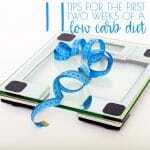 What decorations should you use? 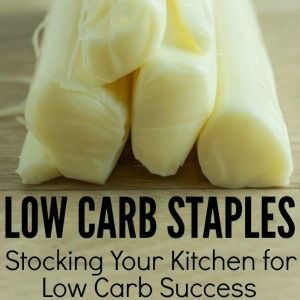 Where should you put them? Not always the easiest things to decide. 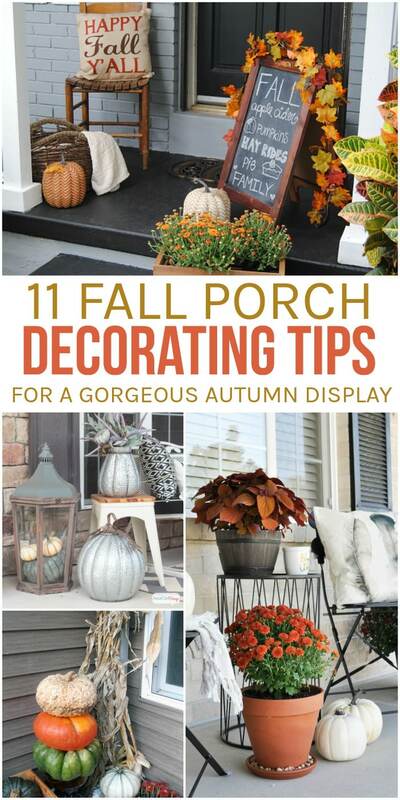 So, if you’re looking for some ideas on how to get your front porch ready for the season, this list of 11 Fall Porch Decorating Tips (complete with inspiration from other beautiful porches) is sure to give you all of the info you need to make decorating a lot more fun. This simple addition can make or break your front porch, but it can be easy to overlook when decorating since it’s such a small detail. Make sure to pick up a Fall-themed wreath from the store or make one yourself to ensure that your porch looks complete. 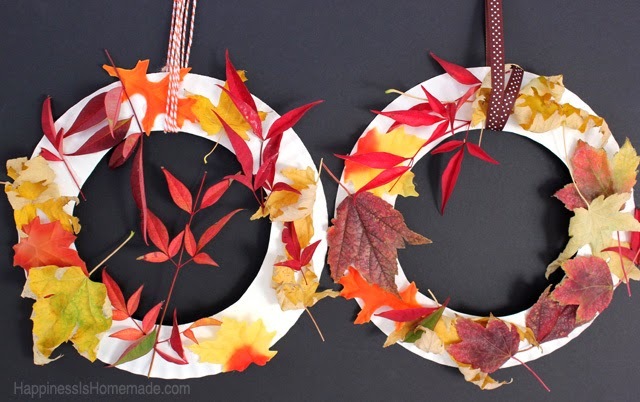 This beautiful DIY wreath from Simply Designing is super simple to make, and you can switch up the flowers if you want so that it will match the rest of your décor. It can be tempting to use every cute Fall item you happen to find to decorate your front porch, but it will look a lot better and make a lot more sense if you pick (and stick to) a more specific theme. 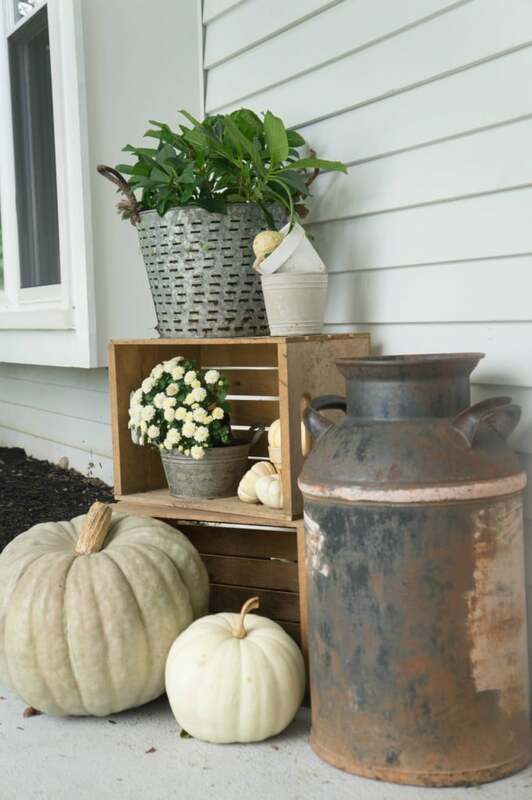 Seeking Lavender Lane chose a farmhouse theme for their Fall porch décor, and it turned out super cute! 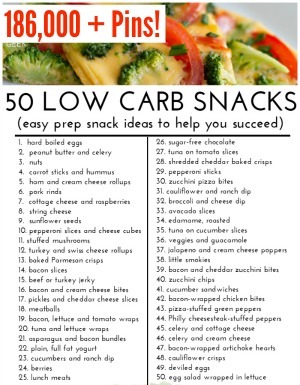 There’s no need to buy a ton of new stuff. 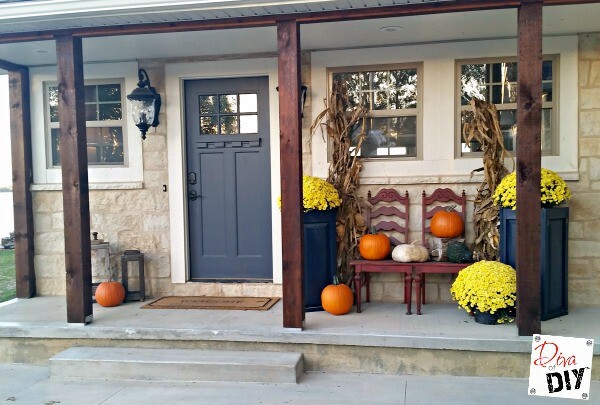 With a few simple changes, you can make your normal porch décor look Fall-themed. 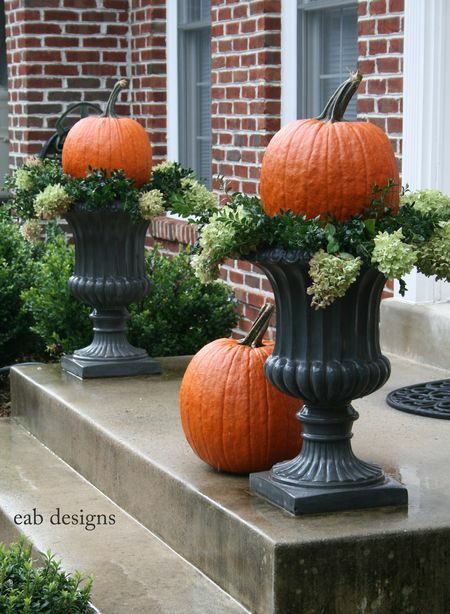 This post from EAB Designs shows how they took the urns that were already on the porch and added hydrangeas and pumpkins to make beautiful, in-season, pumpkin topiaries. 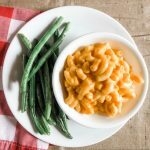 Even if your door isn’t dead center in the middle of the porch, making sure that you have something on each side is important. Add smaller items next to the door on the smaller side of the porch to make everything look balanced. 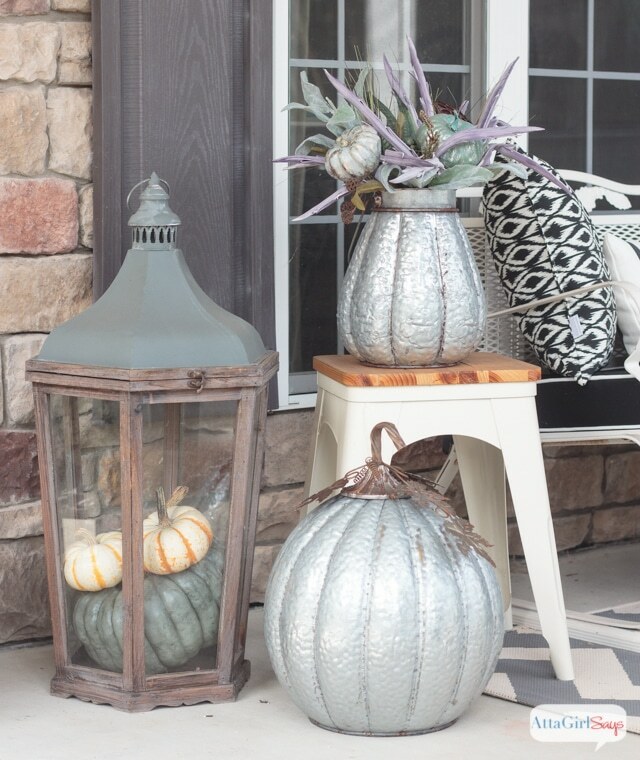 This example from Diva of DIY uses lanterns and a pumpkin to round out their porch. If you have a bigger porch, you should make sure that it doesn’t look too empty. And if your porch is smaller, you definitely don’t want it to look too cluttered. So, make sure to keep your porch’s size in mind while you’re buying or making decorations. 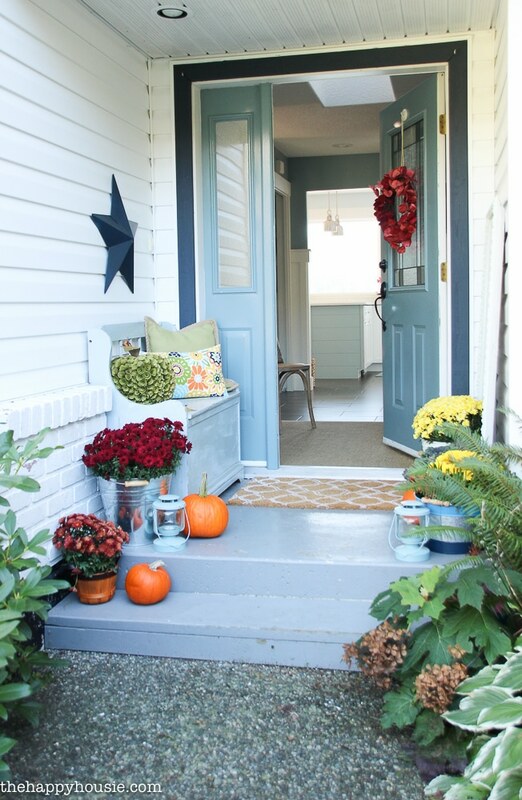 This porch from The Happy Housie shows how you can make a small porch look festive without totally blocking the door. 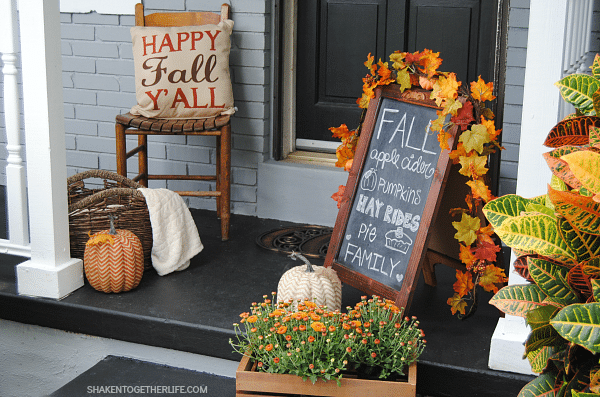 You don’t have to fill every corner of your porch with Fall-related items to make your home look seasonal. This porch from Cherished Bliss is the perfect example of how using a few choice items can totally transform your porch. Of course, you don’t want your porch to look the same as all of your neighbor’s porches. Adding some things that are specific to your family will make your porch so much more special. 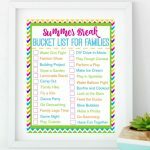 Shaken Together does this by adding a chalkboard easel to their porch and using it to write their favorite things about Fall. 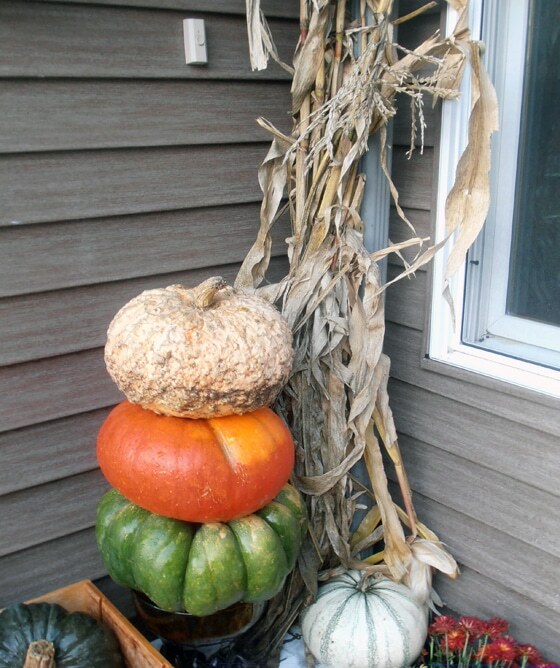 Instead of sticking to your stereotypical orange pumpkin, make your porch look more interesting and colorful by using different kinds of pumpkins and gourds. This porch from Second Chance to Dream not only has a pumpkin topiary made of pumpkins with various colors and textures, but it also has a cute crate filled with a variety of gourds. Why decorate everything yourself when you can have your family help? Encourage your kids make some decorations for the porch and put it up themselves. They’ll love coming home to see their creations hanging for all the world to see. 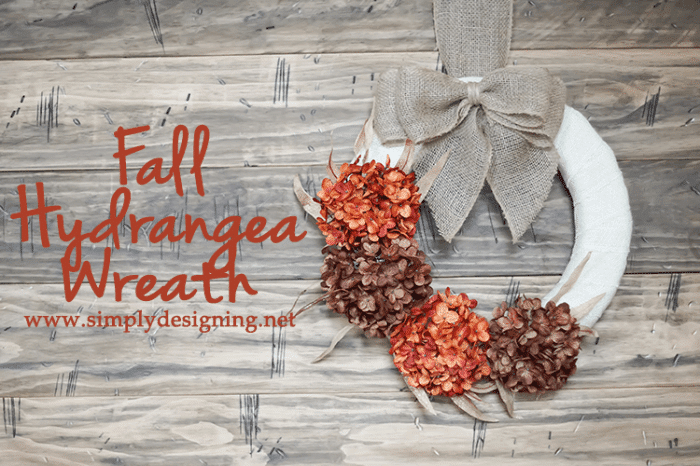 This fall leaf wreath from Simply Designing is a great way to get your kids to help make the porch more festive. 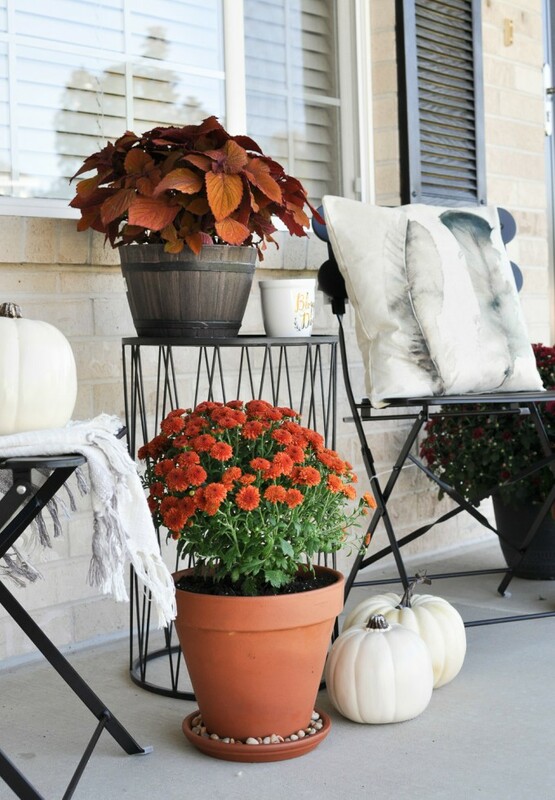 Plants are a great way to spruce up any front porch, and there are so many that go well with other Fall decorations! 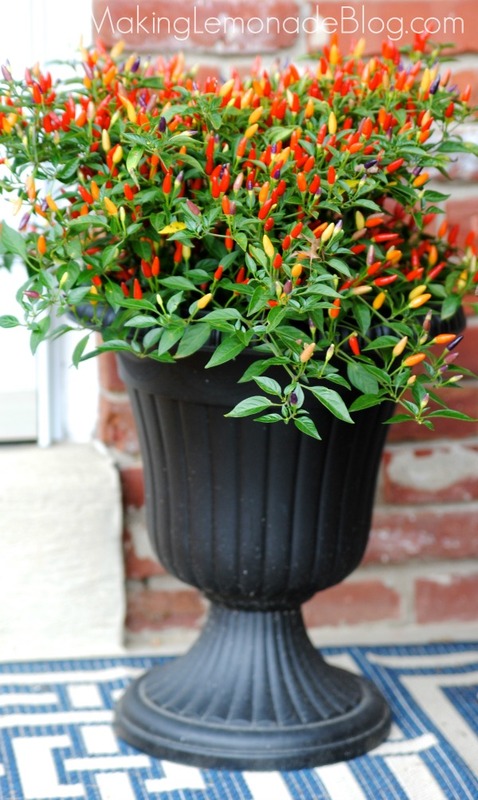 This porch from Making Lemonade has chili pepper plants to make everything more colorful. While typical Fall colors like orange, yellow, red, and brown may look beautiful, they might not be the best choice for your front porch (especially if the exterior of your house is a color that totally clashes). 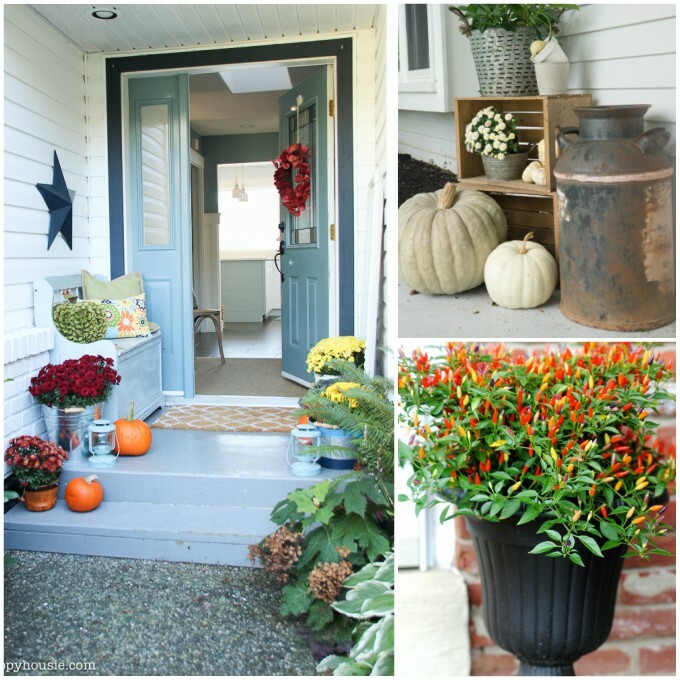 Atta Girl Says shows how you can use other colors and still have a Fall-themed porch. Hopefully this list has given you enough tips and inspiration that decorating your porch for fall no longer seems like a daunting task. 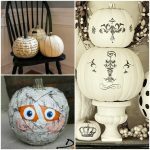 Keep these in mind, and your porch will be beautiful, festive, and uniquely yours in no time. And you just might have some fun while doing it. Happy decorating!